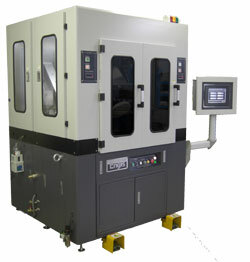 EJW-610IFN-2AL/CMP is a high-precision automatic lapping system that is optimum for sapphire wafers or SiC wafers use in manufacturing LEDs and power devices that require high-precision lapping and polishing processes. This system is equipped with a high-precision facing unit and uses a lapping plate of maximum 610 mm (24”) in outer diameter. It allows simultaneous lapping of two wafers put into vacuum contact with the vacuum chuck by pressurizing, driving, and oscillating them. For the details of this product, use the Contact Us form.